"The section aims at understanding brain mechanisms underlying emotion, memory, perception, and communication. We are analyzing single neuron activity, neural connections, and effects of various molecules on behavior. We also conduct human brain imaging studies." 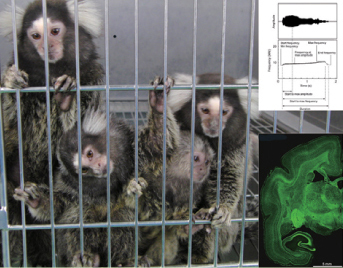 "photo: A family of common marmoset, an example of acoustic analysis (right top), and a fragment of brain (right bottom)"